Why Choose a Backpack Flag? 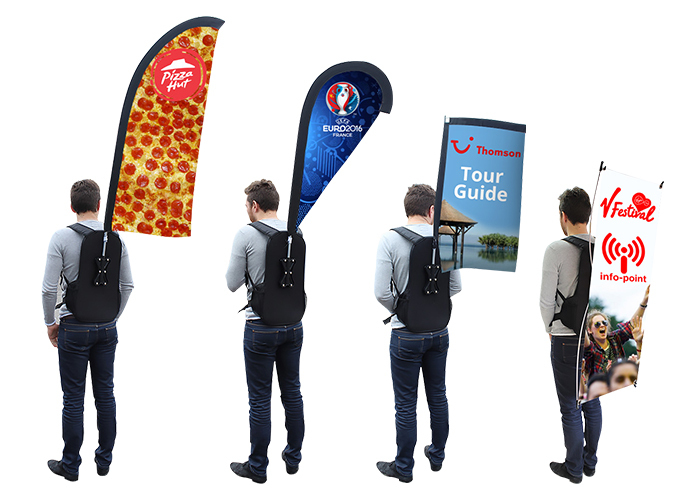 The Backpack flags have a variety of uses, from indoor exhibitions to outdoor trade shows, charity awareness to sporting events, tour guides to directional signs – a backpack flag can be a low-cost display solution for any event. These unique promotional flags are not limited to outdoor use but can be used at any event either indoors or outdoors. A rucksack flag is a visual and striking way to promote your business whilst on the move. Our backpack flags are lightweight and highly portable allowing for easy transport and storage. The backpack flags come with its very own specially designed backpack. This backpack has been designed to support the flag whilst in use and has padded shoulder straps and adjustable chest straps to help keep your backpack in place whilst the flag is attached. When you are not using the flag it can be packed down into the backpack and held securely in specially designed compartments. The unique design of the backpack flag allows you to use it at almost any event. It is suitable for a wide range of promotional events such as festivals or charity awareness events. It’s ideal for promoting your stand location at an exhibition or trade show. Alternatively, it can be used by tour groups to help keep your tour group together. It can also be used as a directional sign on the high street for letting people know the location of a sale or promotion. All our promotional flags can be machine washed at 30°C wash with everyday detergents. The backpack flags are a cost effective way to get your brand noticed whilst on the move at both indoor and outdoor events. For just £79.00 the backpack flags are a perfect low cost marketing solution. Our flags are made from 115g polyester flag knit textile which is dye-sublimation printed. Heat and pressure are used to transfer dye onto fabric resulting in permanent, high resolution, full colour print which will not crack, fade or peel. If you need artwork creating for your flag, we offer an in-house, professional graphic design service. One of our designers can create a design that meets your design brief and the final design will not be sent to print until we have had sign off from you. Alternatively, you can send your own artwork in which one of our graphic designers will check before sending it to print. For more information about our backpack flags or help with selecting the right outdoor flag for your event, please contact us or call us on 01733 511030.